Editor's note: We recently sent TravelPulse writer Ryan Rudnansky for a week-long trip to Las Vegas to attend the Well-Being Travel Symposium and document his travels on Twitter. This was his first Vegas experience, and Ryan came back with a few notes we found worth sharing. Folks, I got through my first week in Las Vegas alive, and I didn’t even turn into a drug-crazed lunatic like Hunter S. Thompson. So, in that sense alone, I am eternally thankful. Not only am I forming coherent sentences (I think), I also feel like this week may have helped me personally in some unexplainable way. But the truth is, Vegas doesn’t have to be about spending your last dime on slot machines, or re-enacting “The Hangover” with your buddies, ending up stranded in the desert in the morning with no recollection of how you got there. The truth is, Vegas is what you make it, just like anything else. What do I remember the most about my week in Vegas? It’s as clear as day to me. It’s the people I met. In our society, it’s easy to get caught up in the X’s and O’s of everyday life. It’s easy to get swept away by the bustling nature of it. And, ultimately, when you are yearning for that hot car on the market — or simply hoping to get through the day with a penny to your name — it’s easy to forget about what really matters: connecting with real, live human beings. Human beings shape this world. Not even government, which we tend to look at as more of a robotic machine with no personality than what it really is: a collection of individuals following or leading a certain way of thinking. I attended several amazing events, toured a bunch of fantastic properties and dined at several mouth-watering restaurants this week in Vegas, but what really stands out for me personally is the connections I made. Now, obviously, making connections is good for business. But when relationships go beyond just the business side of things, they take on a whole new meaning — simply put, everybody’s life gets a little bit easier and, consequently, more enjoyable. While there’s no denying that making a good impression on someone can help your company or your career, when you start going into each new interaction with a genuine interest in that person or group of people, more often than not things naturally seem to work out well for both sides. I can honestly say that I really enjoyed meeting everyone I met during my stay in Vegas this week. Now, it may be a little unrealistic to expect every interaction from here on out to work out so well, but I don’t think what I experienced is all that crazy, either. I could tell that the people I met this week were about more than the bottom line. They obviously wanted to get the word out about their respective companies, but I truly got the sense that they wanted to help me out, too. There were some people I knew had an extremely busy day ahead of them, but I never felt like they rushed through our meeting so they had more time to get everything done. And, honestly, sometimes I can just start rattling off questions out of simple curiosity, so if someone missed a deadline or had to work past your shift because of me, I am eternally sorry (I really need to stop asking everyone what the meaning of life is). So, for those hoping the story of my first week in Sin City would mirror “Fear and Loathing in Las Vegas,” I apologize if I wasted your time. 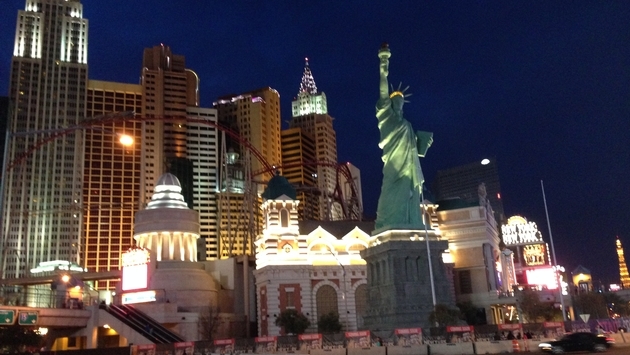 But perhaps what is so surprising to me about my week in Vegas is, well, Vegas surprised me…in a wonderful way. Places like Las Vegas or Los Angeles tend to get more than a handful of negative stereotypes (and, I will admit, I had some unfair prejudices of my own before coming to Vegas), but the more people I meet, the more I realize we all are very similar. We all have the same basic needs, and one of those basic needs is the desire to live the life we were individually meant to live…while helping others along the way. Whether you truly care about other people or you’re only interested in “personal gain” right now, we all eventually realize the same thing: Making connections is about more than handing out business cards. It’s about making genuine connections, allowing this world of ours to flow much more smoothly in the process. So, to all of the people I met, thank you for making my first week in Vegas something I will never forget… and making this not just a business trip for me, but an experience I know has already helped me profoundly in some unexplainable way. Whatever industry you’re in, remember that you can have all the inside knowledge, all the talent and all the experience in the world, but it’s how you treat others that can have the greatest impact personally and professionally.